This is hilarious! 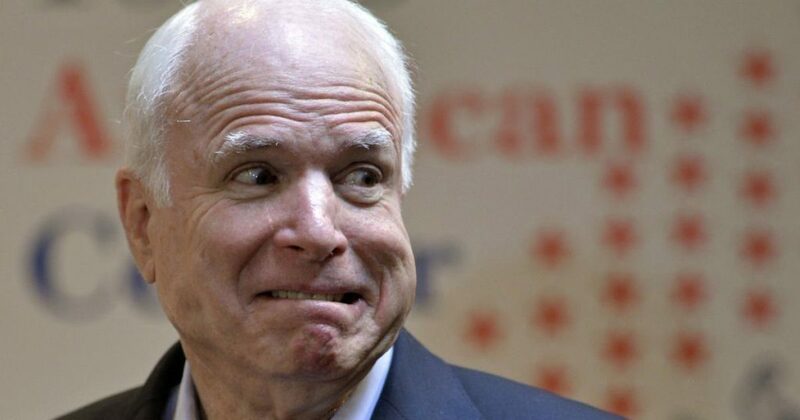 In a Powdered Wig article we published Thursday morning, wino LeRoy explained why Songbird McCain was seen wearing his orthopedic walking boot on the wrong foot, the uninjured foot. Excerpt from Thursday morning’s article…. We called Senator Songbird’s office for an explanation but received no answer. We were, however, able to find a wino, not to be confused with Rino, on a bench near the Capitol, and asked if he knew Senator McCain, and if so, could he please explain the now-infamous walking boot scandal. Once payment terms of a pack of Lucky Strikes and a bottle of Thunderbird had been negotiated, LeRoy did, in fact, confirm that he and the Senator are close friends. He praised Senator McCain for his service as a lifelong parasite public servant and declared that the controversy can be explained easily as the Senator’s love for equality. His right foot getting all of the attention was bothersome to Senator McCain, who is all about equality, LeRoy explained, thus he alternated the walking boot to keep his left foot from feeling left out. This is very close to the actual excuse Senator Songbird himself tweeted to the world shortly after we published our article…. Thank you for your support & best wishes. My left leg was doing extra work to compensate for the boot, so I'm giving it a break. I still hate wearing this boot, but it won't slow us down from frying 7 turkeys today! This lamest of all possible excuses caused a twitterstorm. Some of our favorite responses…. You are so full of sh!t. Why would you take the boot off your injured foot and put it on your good foot, causing further damage to the injured foot and doing absolutely nothing for the good foot? Unless, of course, you were lying from the start and this is some hopeful CYA. That doesn’t even make sense, but consider the source. Wearing a boot is exhausting. But how in the world does switching it help?! Put the burden on the actual injured/just healed leg b/c the other got tired?! Absurd!! A whole day to come up with the worst excuse ever. It's confirmed, he is a Democrat. Wow sounds great… when are you goin to repeal Obamacare??? So while people can't afford to buy a turkey cuz they're forced to buy Obamacare, you're bragging that you're frying 7 of them? Shameful. If you hate wearing it so much, why would you put it on your good foot for no reason at all? Makes no sense. I wore a boot for 6 weeks after a while it wasn't a big deal! You get used to it! Certainly wasn't advised by my surgeon to switch which leg I had it on!